Fully adjustable in girth and length for a customized fit via six tension straps on sides and two Long velcro strips on shoulders- One Size Fits Most. Four Rifle Mag Pouches (1 Right, 3 Left) ,1 adjustable Cross-draw Holster , Three Double-mag Pouches, 2 Large Internal Zippered Map/Document Pouches.Both with Belt Loop Ready for Belt Carry. Heavy Duty Back Loop System - To Carry Additional Gear/Tools, Durable Rescue Handle with Maximum Strength for Most Dependable Field Operations. Mesh Ventilation System Helps Release Moisture and Heat. 30-Days NO RISK 100% Full Refund Assurance for any reason .The best and only Tactical vest you'll ever need. If you are not satisfied for any reason,such as size and any other reason, money back guarantee! Here you will get product of High-rated quality materials, professional performance, reasonable price and great customer service. 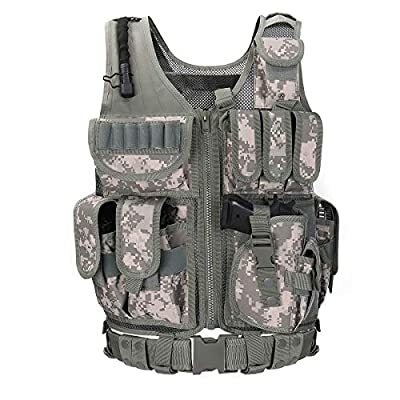 ONE SIZE FIT MOST tactical vest - Item size: 22.83*15.74*4.33inch(58*40*11cm), Fully adjustable in girth and length for a customized fit via six tension straps on sides and two Long velcro strips on shoulders.Adjustable sizing S-XXL for US Men's clothing size(up to 55" waist size) NUMEROUS POCKETS:The tactical vest come with a lot of useful pockets with zippers or buckles,provides large storage. MATERIAL: 600D high-density Polyester , features with a comfortable durable. BREATHABLE MESH:Tactical vest is mounted on tough nylon mesh material, more ventilative.